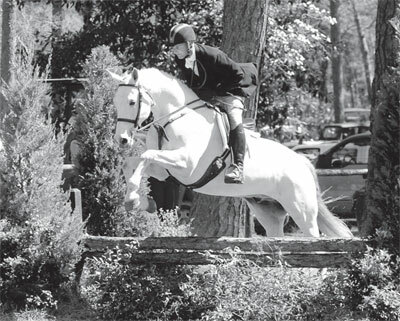 Historically, the Aiken Horse Show in the Woods has been the culmination of the Aiken winter equestrian season. It was started in 1916 by Louise Hitchcock, who conceived of it as a competition among the members of the old Winter Colony, as well as a place to showcase the many beautiful horses in town. The first show, which had 17 classes, was held on March 16, a beautiful but windy day. In the 1920s, the show expanded to two and then three days. Children’s classes were an important part of the show, including a leadline class for the smallest children, which gave ribbons to every competitor. Once the children graduated to riding by themselves, according to an article written by Mrs. Hitchcock in 1928 in The Sportswoman, they had to “begin to learn to be good losers.” The 17 and under class was another of Mrs. Hitchcock’s favorites. “There is no place in the world . . . where from the ages of two to eighteen, such a number of coming horsemen of both sexes can be found,” she explained. The 17 and under class featured children from the age of 11 to 17 riding hunters. These were generally not the horses these children usually rode. Rather, they were horses belonging to adult members of the Winter Colony, who allowed the children to ride them for the class. The horse show continued to expand in the 1930s, with as many as 350 horses showing over the weekend. When World War II came, although the show got smaller again, the tradition continued. For instance, in 1942, there were just 16 classes, more than half of them for children. In 1944, at the height of the war, there was just one class for adults, the open hunter class, with seven classes for children. 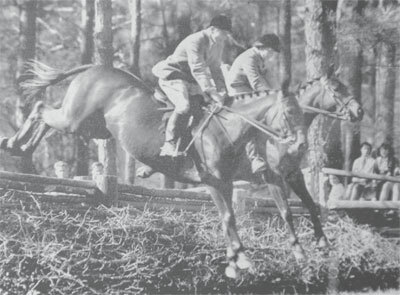 At the war’s end, Aiken once again became a haven for horsemen, and the Aiken Horse Show regained its prominence. By 1950, the show was part of “Sports Week,” a week of festivities that also included the Aiken Trials races, polo matches, drag hunts, golf games, and a sports day at Aiken Prep. The events were prominent enough to attract the attention of the national press. 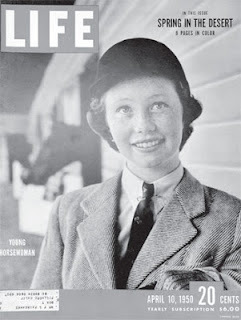 For instance, in 1950, Life Magazine featured a photo of a teenaged Aileen Wood on the cover, dressed in her horse show clothing. Inside the magazine, there was an illustrated article about the events. “Big Week at Aiken: Horses and the Horsy Society Wind up Winter Season.” Photos that accompanied the article included pictures of horses being judged in hand, as well as a great shot of Pete and Dolly Bostwick jumping together in the pairs class. 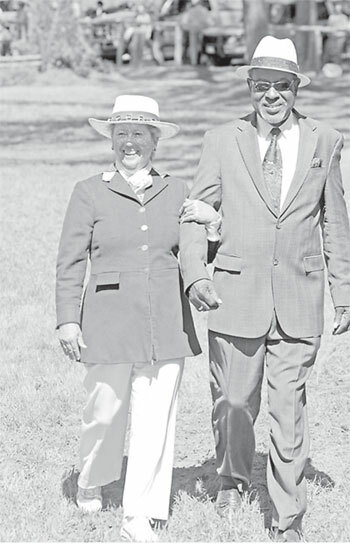 From the mid-1980s until the early 1990s, the Aiken Horse Show went on hiatus. It was brought back through the efforts of many dedicated horse people, especially Kiki Blalock, Sandy Cassatt and Gail King, who is one of the directors of the Aiken Horse show today, and is a trustee and former chairman of the Hitchcock Woods Foundation. 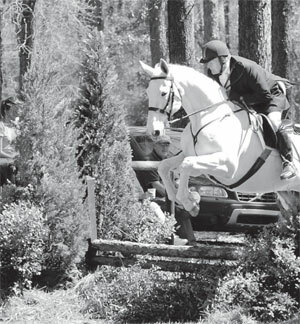 The show grew slowly, but steadily, and in 2012, is once again an important annual tradition that brings Aiken’s equestrian community together at the beautiful little show ring under the pines. 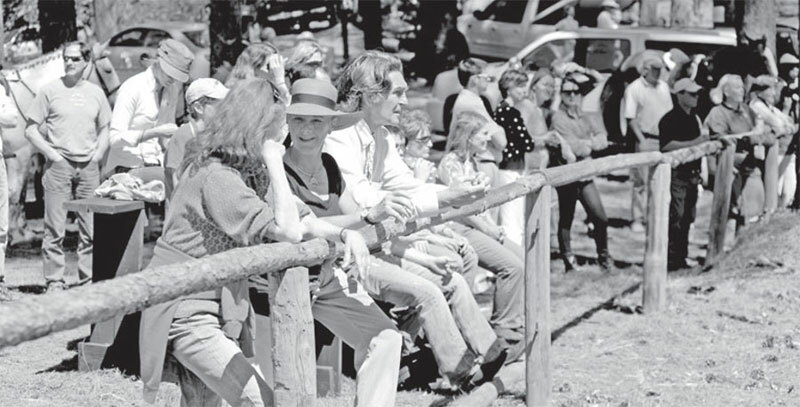 In these years, too, the Hitchcock Woods Foundation has worked tirelessly, and with the support of the equestrian community, to preserve the Woods and ensure that it, along with the tradition of the horse show, will endure for many years to come. Friday: classes include open and amateur hunters, as well as gentlemen’s hunter hack. Saturday: The morning classes are for children. There is a sidesaddle division in the middle of the day, including an over fences class. Popular afternoon classes include the family class, the costume class for children, junior classes and pleasure classes. Sunday: The morning is devoted to the foxhunter division, which is the most prestigious of the show. This is followed by the junior foxhunter division. Watching the Show: There are many ways to watch the horse show. The most relaxing way is to reserve a table in the ringside Hitchcock tent, where you will be able to watch the show, enjoy a catered gourmet lunch, and support the Hitchcock Woods Foundation, which receives proceeds from the show. There are three packages available. Longleaf Pines ($2,500) gets you a table for eight in the Hitchcock Tent, with a hunt breakfast on Saturday and lunch on Sunday. Loblolly Pines ($1,250) is a table for eight in the tent with a meal, either on Saturday or on Sunday. Southern Magnolias ($625) is a table for four with a meal on either Saturday or Sunday. These packages are particularly good for people who might have out-of-town guests that they want to introduce to the Aiken horse world. If a place in the tent is out of the budget, there is no entry fee to get into the show, but there is a $10 general parking fee per vehicle. For those who would like their own ringside seat, there are also a limited number of parking spots along the rail, for $100 per day. perfect for competitors. Individual lunches are also available for $75 each. Competitors and spectators may elect to purchase lighter, more economical fare from the Dinner Bell mobile kitchen. While at the show, everyone is invited to come to the tent to bid on items at the silent auction, organized every year by Jane Page Thompson. There are always a number of things that will interest those who love Aiken, including books, artwork and historic Aiken memorabilia. The most impressive silent auction item is always the African safari, donated each year by Heidi Beaumont and her company International Ventures. This year, there is also a set of tickets on the third base line at the Red Sox versus New York Yankees game next September at Fenway Park in Boston. Jane Page is still in the process of assembling items for the auction, which gets better every year. The Aiken Horse Show is more than just a tradition, it is also an important element in preserving the future of the Hitchcock Woods, one of Aiken’s most treasured resources. The show is the major fundraiser for the Hitchcock Woods Foundation, which is now winding down a capital campaign that began in 2006. This campaign involved a number of important initiatives, including the purchase of 10 acres of real estate to protect and preserve the natural character of the Coker Spring entrance to the woods. Over the past six years, the foundation has put in place a number of programs that will help maintain the natural beauty of the forest, keep the ecosystem healthy and provide habitat for endangered wildlife. The latest initiative is a partnership with the National Wild Turkey Federation to restore and preserve the long leaf pine forest. The NWTF has received a grant from the U.S. Fish and Wildlife Service, and will begin work this summer.